Before we start, many of you have asked me what the best slow cooker you should get is. It varies for every family, but I tell you all about it here: Best Slow Cooker Choices. Add chicken, broccoli, potatoes, carrots, onion, garlic, chicken stock, and spices into slow cooker. Once chicken is tender, shred it with a fork. Mix together cream cheese, flour and milk. Stir milk mixture into slow cooker and add back the shredded chicken. Cook on high for another 3o minutes. When ready to serve, add cheese and bacon. 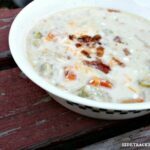 Garnish each bowl of soup with green onions, additional bacon and shredded cheese. Cook bacon, let cool & crumble into pieces. Mix chicken, broccoli, carrots, onion, garlic, 3/4 of crumbled bacon and spices in a gallon size freezer bag (or use the original bag that the chicken came in). Place the rest of the bacon in a smaller sandwich sized freezer bag. Put this bag inside of the larger bag. Pour contents of bag into slow cooker. Add chicken broth to slow cooker.